My friend Anastasia recently moved several states away. While we were at her house packing she and I came across a bunch of cleaning supplies in her laundry room. As we contemplated the change in altitude and how that might affect the liquid cleaners Anastasia decided she didn't want to risk anything expanding and leaking inside the box and potentially soaking into any surrounding boxes. So she gave it all to me! 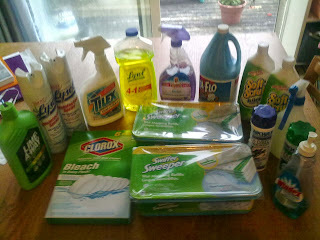 I was so thankful because many are items I regularly use and even better, I was getting pretty low on cleaning supplies so this stocked me up! Every time I'm my laundry room I see all my cleaners and am reminded of my friend and how God continues to be the great provider for our needs.